Monday was my girlfriend’s husband’s birthday. He is an Edmonton (Canada) native and a fan of the Edmonton Oilers hockey team. She surprised him by renting out an ice rink for an hour and the group of us (attempted) a hockey game. It was really funny watching him skate circles around all us Floridians. 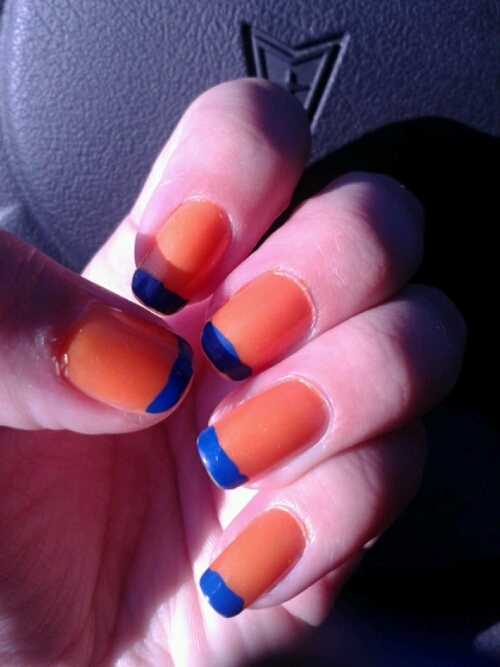 For my nails I did the Oilers colors of royal blue and orange. Of course, most of my students thought they were Gator (football) colors.